The Helios 1200 produces over 113000 lumens. Starlite LED introduces Helios 1200, powered by Flip Chip COB LEDs, is a first in class single source 1233 watt output LED Fixture. While boasting 113,458 lumens at 5000K CCT and 70 CRI with 720 LED chips (99.4lm/w), its fixture size is 17.6” x 16.3” x 27.9” and runs at an operating temperature of -40˚F to 158˚F. The light engine is powered by Flip Chip Opto’s 3-PAD patented technology, the Apollo 2400; driving heat dissipation to its maximum and thermal resistance to its minimum. The Helios 1200 is customizable for a CCT of 2700K to 5600K and a CRI of 70-95. Additionally, with structural technology implemented at the component level, four independently power controlled sections allows up to four different CCT and CRI selections on the same fixture. 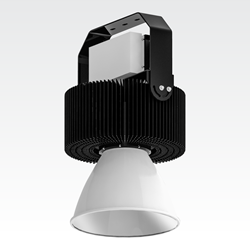 With its heat sink made from AL 1050, AL1070, and AL1090 aluminum, the thermal resistance is enhanced to 0.075°C/W and weighs 56 pounds allowing the fixture to be passively cooled with its relatively small fixture form-factor. Its cold forged heat sink core with patented Forging Fit Technology is capable of cooling up to 1200 watts of LED power. The luminous flux is further enhanced by a 35 degree spotlight reflector with waterproof tempered glass lens. The Helios 1200 comes with an adjustable 270 degree swivel, and has multiple adaptable bracket connections that fit a variety of masts and poles. With advanced heat pipe technologies, the Helios 1200 is the only fixture that can be operated upright without any damage or complication with its thermal properties. With such adaptability, the Helios 1200 is suited for stadium lights, golf courses, docks, transportation hubs, container fields, high security areas, and many more industrial applications. Additionally, with the options of IP65 and IP67, underwater applications are enhanced allowing the Helios 1200 to be submergible underwater for a short amount of time.